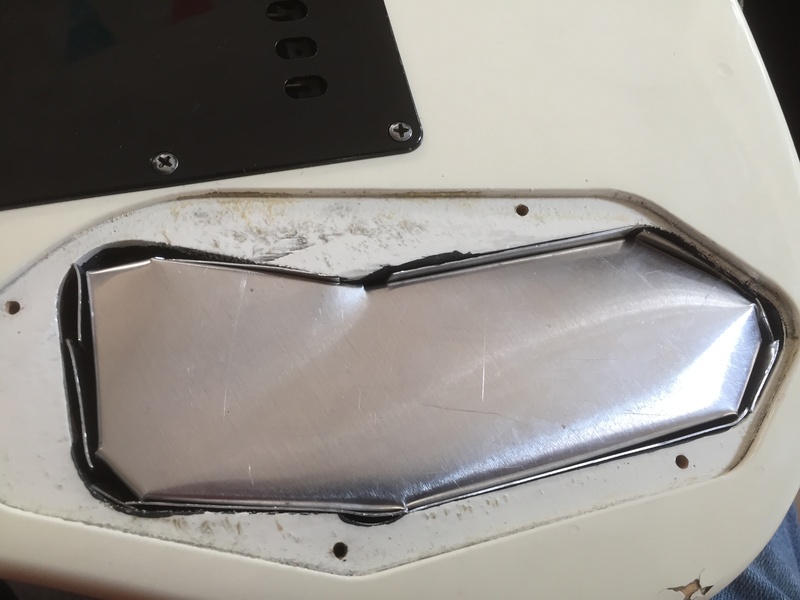 A few weeks ago, I completed an article about fixing my Ernie Ball/Music Man’s warped pickguard. While I had all of the electronics and pickguard off of the guitar, I noticed that the only shielding on the control cavity was a small strip of aluminum tape on the pickguard where the controls were. Now, the normal pickups in this guitar are humbuckers: a Custom Custom and Alnico II Pro. Being humbuckers, the pickups themselves don’t hum. But get them near light dimmers, fluorescent or neon lights, and dubious club wiring, and all sorts of buzzing happens. So, we’ll get this straight now: Shielding will never get rid of that 60-cycle hum that is present with single coils. Single coils have their own unique, beautiful sound, and part of that admission to Tone Angeles is that hum. What shielding will do is prevent the wiring inside your guitar from acting like antennae and picking up stray signals floating around. If you want to get rid of hum in single coil guitars, you might have to switch to stacked single-coil sized humbuckers. The idea of shielding is to enclose the electronics in sort of a ‘cage’, which rejects stray radio frequency interference. You can do this a few ways: copper or aluminum tape, or graphite shielding paint. Shielding paint looks better, but it is expensive. It isn’t a good investment unless you have more than a handful of guitars to shield, and it isn’t something you can just pick up at the local hardware store either. The copper or aluminum tape was a better idea for me, since it was cheap (I am a musician, remember), and while you can even use heavy duty aluminum foil and glue, I opted to order some 3M copper tape with adhesive that is conductive, off of Ebay. This is important because the puzzle pieces of tape you cut will have to overlap- if the adhesive wasn’t conductive, I would have to solder every piece of tape to each other. By the way, while aluminum is actually better at rejecting RF signals, can’t easily be soldered. Since I had never shielded a guitar, I didn’t know what I was in for, so I went with copper. …and here is the patient. I cleaned the cavity. There was lint, wood, and who-knows-what-else in there. I used packing tape to pick up the tiny bits. I made sure I jammed the packing tape in every little crevice, since there were lil bits ‘o stuff everywhere. Then I used some compressed air to blow out the stuff I couldn’t get. I then put some alcohol on the cloth to ‘de-grease’ and further clean the painted surface. I cleaned the back of the pickguard with tape and then alcohol too, since the copper had to form a cage around the electronics. My tape was 2” wide, so I covered the back of the pickguard. Over the pickup cavities, I used a razor knife to cut out the pickup holes, making sure no copper could be seen from the front. I then started cutting out shapes for the cavity. I started this with the razor knife, then soon went to scissors. Scissors were better for the strips and triangles I had to cut to make it all fit. I overlapped all of the pieces, leaving no paint showing underneath. This looks much better a few steps away than it does close up. There are a lot of little pieces! Here, I am about halfway done. I made sure I had a few pieces of tape angle over the top so it could contact the tape on the pickguard. This is the back of the pickguard. The foam on the neck pickup keeps it from tilting backward when in the cavity. There, I fixed it! I used a multimeter on set to beep on continuity. I wanted to make sure pretty much every piece of copper was electrically connected to each other, and to the ground of the electronics. In the end I didn’t have to solder anything. I will say, I did notice a few paper cut-type slices on my fingers. I didn’t realize the edges of the tape were so sharp. Maybe thimbles next time? Also, the tape is sticky, so when I stuck it down, that was where it was going to stay. You can get it back up, but it will pull up any tape it is connected to. This all took me about an hour from start to finish, not including putting the electronics back on the pickguard, restringing, and testing. However, in the end, I did take my guitar to a place where there are rows of fluorescent lights, where the buzzing was really bad – the local music store! Usually my guitar buzzes like crazy there, but it was silent. Unless I plucked a string, I couldn’t even tell if the guitar was plugged in. Success! For my first time shielding a guitar, I think I did a pretty good job. And I have enough tape to do maybe two more. So, it turns out, shielding, like wiring and restringing, is something guitarists should learn to do on their own. It’s a fun and inexpensive project that will have you guitar as quiet as a scream in space. Are there any current projects you have tackled for the first time? How did they turn out? Share your success (and disaster) stories with the rest of us. Sure you can. But it will be almost half effective. If there is a stained-glass supply store, they’d have it. I bought a single peice 2ft x 1ft with sticky backing for about $15, did 2 guitars and have some left over. But the glue is not conductive. With a sheet that size, you can cut one piece large enough to cover the whole cavity and pickups on the back of a strat pickguard, and then cut the holes out, rather than making a patchwork like in the article. What if your guitar doesn’t have a pick guard like that? Like a Les Paul? You can still shield the pickup and control cavities. Would u have to connect a wire from the pickup cavities to the controll cavities for it to shield? All the shields should be grounded. 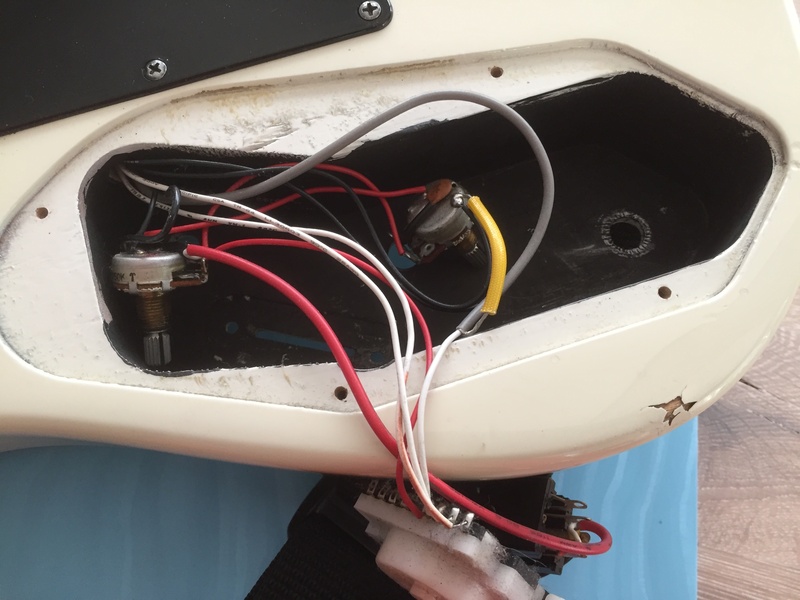 You can connect to the pickup wire shield but it’s better to run another wire to connect the pu cavity shield to the main cavity. You do it the same way, but cut holes where the controls go through the body, and then shield the control cavity cover on the back. Did a re- radius on fretboard from straight 12 to a compound 12-16 along with binding and a full stainless steel refret. It was intense i took my time and it came out pretty decent im confodent i do it beteter next time. not only for the guitar. i did copper shielding for the Wah-Wah covered the inside + sides + backcover & over the fasels . got rid of all he noise. I’m in Japan and was able to find adhesive backed aluminium foil, both 50mm tape and A4 sheet at the ¥100 store. It is about half a millimetre thick and made to use in kitchens. It worked a treat and stopped any interference. – ’62 reissue Jap Strat with US vintage pick ups. I’ve shielded a lot of guitars using either aluminum duct tape or flashing tape, available at pretty much any hardware store. You do have to remember that the adhesive is non-conductive, but if you fold over an edge and overlap so that the two faces of any pieces you use touch, you get a good shield, it conducts. Soldering is not needed. I also like to use aluminum plate for pickguards and cavity covers.I see in the last photo where Dave put a few tabs on the top paint so the cavity shield will touch the pickguard shield too, an important point to remember. Another reason for Hum or bad earthing, is that the Jack is Soldered/Soderd the wrong way round. You’ll notice this if you put your hands on the strings and the hum gets quiter. Need to shield a new strat type guitar I just got. I understand all the tape needs to make contact, but how do you make contact between the tape and ground? Do you need to run a wire or is the tape grounded somehow automatically? If you do it right on any S-type, then the pots will be in contact with the shielding tape, that’s where the circuit is completed to ground. You just need to make sure that you don’t cut away too much tape around the pot-holes. which is the best way in your opinion to shield a 56 Lester with P90’s? tape or paint? Either works, so there is no ‘best’. With tape, you have to collage the tape to cover all of the surfaces in the pickup cavity & control area. With paint, you just brush it on. However, shielding paint is expensive. Both work well. HI! Just shielded (2) cheap Strats with the adhesive copper tape a la StewMac. Did the cavities and entire pick guard. The cavity shielding fold over the top to contact the pick guard. I tested the ground with a VOM. No need to solder the joints! Just fold over a small edge of the overlapping foil and stick her on to produce metal to metal contact. A piece of electrical tape to secure and you are good to go! Test w/ VOM and you’ll see conductivity. Easy squeezy. I did many cavities since I wrote this, and as long as the tape overlaps and both sides are conductive, than no need to solder. I am happy it worked out! Not sure if anyone will read this. Perhaps you will get a notification or something. But I was wondering if there’s any difference with a metal plate that covers any cavities, whether it’s on the controls or even over the back where tremolo-springs would be. 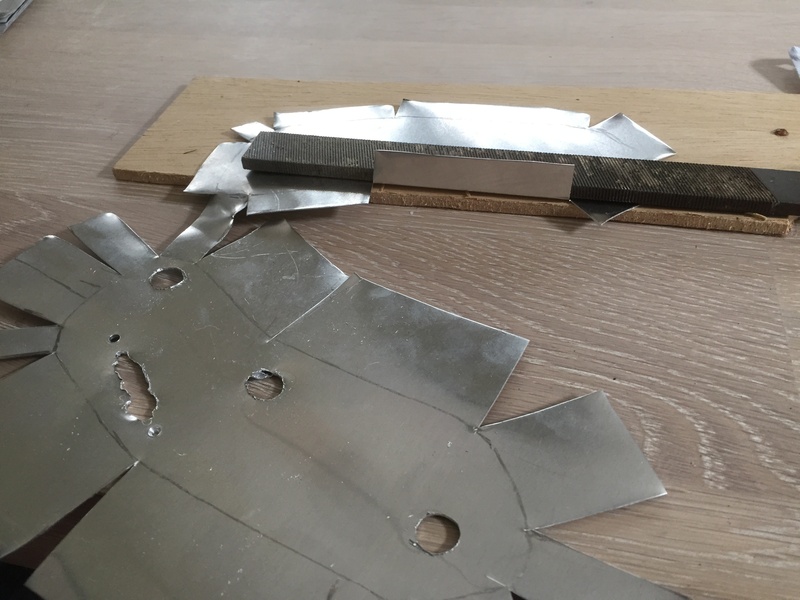 Even if it would work the same (in a protective manner), would you still need to cover the back of a metal plate with copper or aluminum, or could you also just do the cavity and make sure it connects with the bare metal plate? 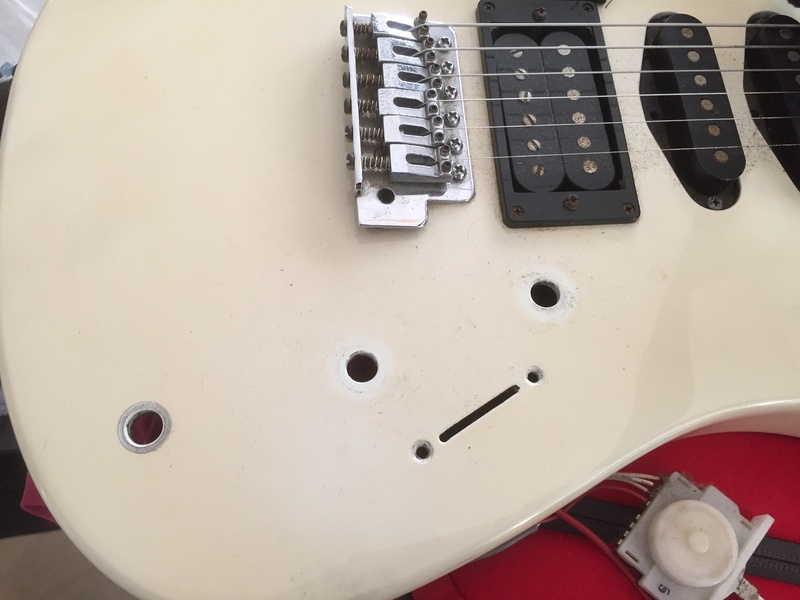 Also, what about the types of pickup-cavities that aren’t covered by a pickguard? (Just a ring or even directly mounted.) They would only be able to be “shielded” from the back and the sides, no? – I mean, you couldn’t exactly “cage” them in entirely. Then again, I plan on getting some pickup-covers by Schaller, and according to them the use of Nickel Silver in them helps reduce microphonic feedback. I don’t know if it also acts as a “shield” to other interference, or if it would actually make it MORE susceptible to signals. A simple but obvious way to test whether paint in the control cavity is conductive is to test it’s resistance with a multimeter! Low resistance = Conductive paint, high resistance = normal paint. Regarding the concept of shielding, you are trying to create a Faraday cage, so if you have existing metal components, like the metal plates mentioned above there is no need to shield them just ensure they are electrically connected to the shielding. This means any copper foil or conductive paint should be extended to the flat areas which the control cavity covers are screwed to, to ensure the foil covering the cavity cover is electrically connected to the cavity’s shielding. If the wires to the pickups are shielded, and the shielding is not used as part of the circuit, the shielding can be connected to the control cavity screen. Pickup covers are different, these will interact with the magnetic field of the pickups, subtly affecting the tone. I’d leave these out of the shielding circuit. Similarly I would imagine any conductive material in the vicinity of the pickups’ magnetic fields would do the same. Isn’t this supposed to be one of the factors behind the sound of a Tele Bridge pickup? How did you avoid shielding? Lol! OMG… Sorry I meant to ask how you avoided soldering? I embedded the ground wire within the sticky copper tape. The tape itself overlaps, is very sticky, and both sides are conductive. If the manufacturer does not shield pickups themselves then he knows what he is doing. If you shield pickups cavity then you automatically shield every pickup you will install. Isn’t better and easier to shield pickup itself on idinvidually sound basis of each? Not the same thing. The wires coming off the pickups can act as antennas. Every wire in an electronics cavity is susceptible to electronic interference. Wires which come from pickups are shielded. I have never seen unshielded wires on pickups. 🙂 Did you? Electronics cavity must be shielded for sure. I did not say anything against it. I told about springs cavity where only a ground wire goes to. And the big question is… Does it affect your tone somehow? Actually, yes. It gets rid of most RF interference, which makes your tone much better. As far as affecting the actual sound the strings make, I am not sure if anyone has done any before/after studies. I can’t see how it could affect it, though. The color obviously changes the tone. Everyone knows that. Copper would sound warmer, while aluminum silver would be brighter. I’ve been using silver paste. It has much lower resistance than carbon paste. Easy to apply but expensive. question: does silver tape (I guess it’s foil tape, but don’t know specifically) work in the same way the copper tape does? Yes, but doesn’t block RF frequencies as well. It is most likely aluminum-based. the paint is usually already in most cavitys, doesnt always have full continuity throughout the guitar, Real Men Work, and Real Men pay to play, copper tape, connect it with soldering, test for continuity throughout (front and back) best results are all connected as one circuit. finish wiring it back up and i would measure your cavitiys, tape strips, and 2 different sizes of tape rolls should suffice, and I have yet to see even nasa rated pastes and paints, match up to a solid copper surface. if you decide to change pickups/humbuckers, and your gonna strip the guitars guts anyway. . . why not spend 20-30$ in materials, dont have a soldering gun? your probably a child and not a real guitarist/craftsmen so you shouldnt be attemting something that requires monkeys smearing paint or tape and avoiding the real work and testing behind your project. like i said, spend the money and complete all cavities connections with copper tape and extra wire to solder, then test for continuity. . . .why is this even a discussion? do it right, or dont do it at all. https://uploads.disquscdn.com/image https://uploads.disquscdn.com/images/48e9bd34bee782b05cecac1f3ab12e113226c0f50868a59539e3f1f137a50262.jpg https://uploads.disquscdn.com/images/8d71361ecca2a2a3890cbe55e91dd56c278711a5a8c4bbb129ffdc70f0cee31f.jpg https://uploads.disquscdn.com/images/ce8fa3779cffa398ece5f451b1efd1457c2bddf8d70aef676e292cc49d82d907.jpg https://uploads.disquscdn.com/images/6fd8478a6501e5cfecb35b0c8e0f85988c98fe6f6614f1e34a1a00111827e4ea.jpg s/546e23e7015cb021d37f9e0ef33acc9b1f88a781b52f8a86fb54014d20323901.jpg Or what I did is buy a thin sheet of aluminium and start with cutting out a fitting box by using regular scissors. Fold the aluminum and cut holes for the potmeters. By screwing the potmeters through the box you ground it. Although it does leave the short wires to the coils open (few centimeters), it makes a world of a difference. I use copper sheeting for the bottom of pickguards and control cavity covers and copper paint for the cavities themselves. It’s made for painting non-conductive parts before electro-static plating. I usually use 4 coats. The conductivity is only a tenth of an ohm less than the copper sheeting. The cage you speak of is a Faraday cage. What’s happening is that you’re draining all the RFI and EMF energy to ground.